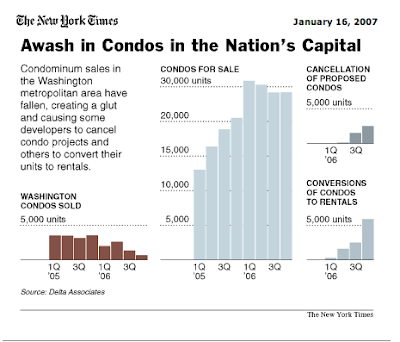 I know, it's January and I'm just getting around to posting data about October home and condo sales in DC. Blame the delay on two things: DC didn't post the data until December and the holidays got in the way. 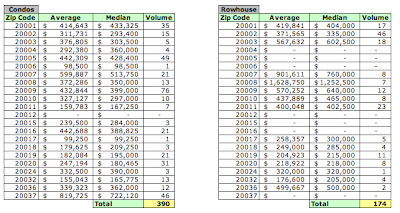 Unlike the MRIS data I've been posting, my analysis includes sales of new and existing homes and condos in DC. 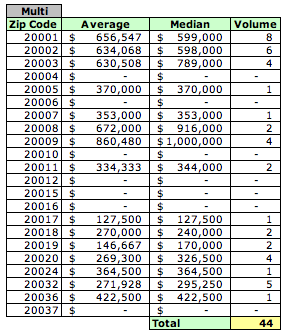 Since I'm using data posted by the city, understand that the chances for error do exist although I've done my best to clean and correct the data [one house in zip code 20011 was recorded as having been sold for more than $56M; I think not]. All metrics are lower YoY, in line with MRIS' data. Condos maintain their 50%+ share of the DC housing market. Formerly built in 2004 as Sovereign Square apartments, this is a 14-story building with 246 condominium units originally priced for purchase from the upper $200's for studios. Units feature granite kitchen countertops, choice of black-on-black or stainless steel appliances, ceramic tiled foyers, Berber carpeting or hardwood flooring, and full-sized washer and dryer in every unit. There is a roof-top pool and deck that has city views. 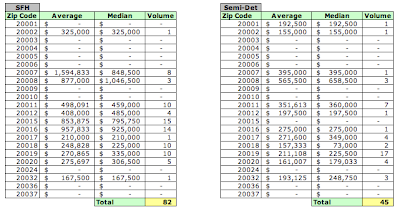 According to my database of 2005/2006 sales, 162 units have been sold through October 31, 2006, excluding three flip sales. Average price: $417K; median price: $406.9K. More than 80 units, fully 1/3 of the building, remain unsold. An interesting article in today's NY Times. According to the reporter, condo developers in DC and other cities are either converting their projects to apartments or are cancelling them altogether. Since the middle of 2006, the frenzied condominium market here [DC] and in several other big cities like Las Vegas, Miami and Boston has collapsed. Once roaring sales have slowed to a trickle, sparse inventory has mushroomed into a glut and soaring prices have flattened out and started falling. The graphic accompanying the story depicts the same trend I've been seeing as I collect data for DCHomePrices.com: significantly lower volume in 2006 compared to 2005. However, it also shows the dramatic growth in unsold inventory. One effect we may see as a result of this sudden glut of new apartments is lower rents in the DC metro area. Industry analysts also point out that rents may start sagging if too many condos are converted into apartments too quickly. While rents were rising at a robust 6.1 percent annual pace in the Washington area late last year, according to the Bureau of Labor Statistics, some buildings in the suburbs have recently started promoting move-in specials and other incentives to lure renters. MRIS' report on sales of existing homes in DC in December is out. The trend first reported in November continues: fewer homes are selling, both average and median prices continue to decline, and time on market continues to rise. 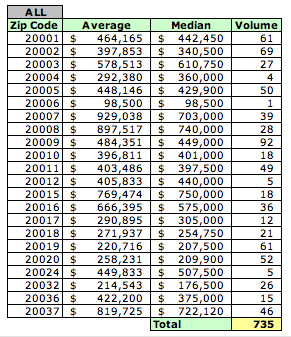 Extracting condos from the data reported by MRIS, the average sales price of a home in DC for December 2006 was $619,365 versus $737,367 in December 2005. 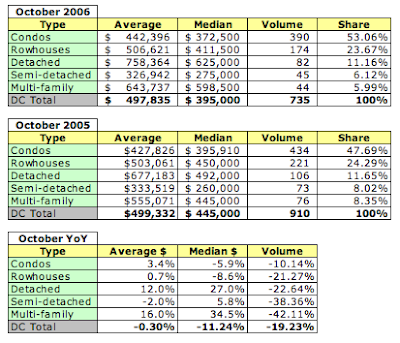 On another topic, October's recorded home sales in DC have been uploaded to DCHomePrices.com. Interesting article in today's NY Times. Essentially, housing sales data reported by the Census Bureau may actually be overstated by 150,000 to 200,000 homes. Worse, homes which have had their sales contracts cancelled are not added to the inventory, resulting in underreporting of housing inventories. The market is in worse condition than the reported data indicates. For the figures on new-home sales have a strange wrinkle that, in the current environment, may lead the government to overstate sales (and to understate inventory) by up to 20 percent. “The market is weaker than the data say,” said Mark Zandi, chief economist at Moody’s/Economy.com. New homes on which contracts are not consummated are not added back into the inventory figure. The most recent report found that the seasonally adjusted estimate of new houses for sale at the end of November was 545,000, or 6.3 months of supply. Given the high rate of cancellations, it’s likely that inventory is substantially higher."